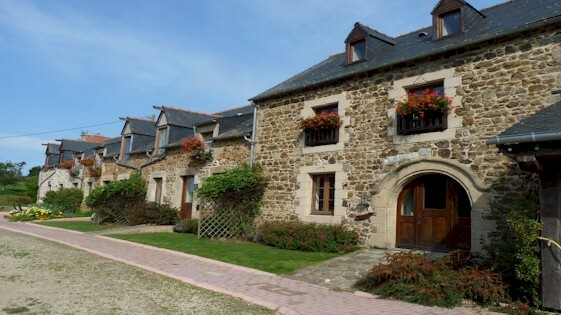 Our 4 gites at La Julerie have been designed and created to make comfortable holiday homes. They have been built in the traditional Breton style, but furnished to meet all modern requirements. Guests will be coming to enjoy the sea, others will wish to be out on the golf courses or by walking, horse riding, cycling, visiting museums or any of the many Breton events that take place throughout the year. 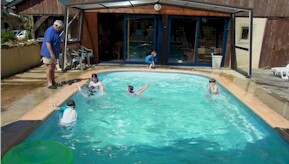 We also have a heated indoor pool to be enjoyed by the whole family. , a walled town, very popular with the yachting world and tourists. Whilst the walls appear old, the town was in fact flattened by the Allies during the War and rebuilt afterwards. The restaurants are excellent. DINARD is a very smart resort; it was popular with the Edwardians and has a genteel splendour. It boasts a casino, several lovely beaches and a therapy complex. DINAN Our favourite, a medieval walled town with lots of shops and sights to see. Take a walk through the English gardens to view the river running alongside the town before taking the walk down the cobbled streets. MONT ST MICHAEL Come and discover its abbey on the border between Normandy and Brittany, one of the first sites to obtain UNESCO World Heritage listing. MONTCONTOUR is a charming small town in the Cotes d'Armor department of northern Brittany. 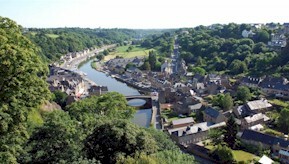 Along with some of the other towns in the region, Moncontour was once the centre of Brittany's renowned lined production.